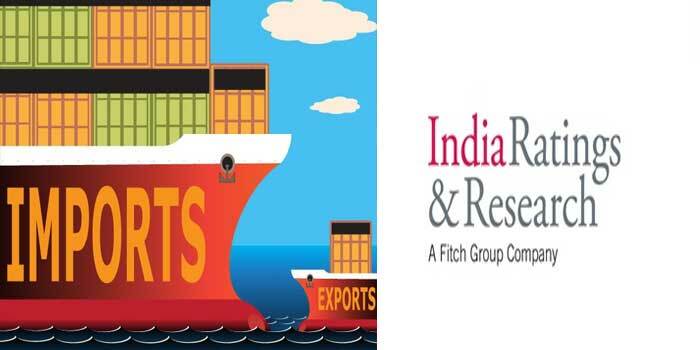 India Ratings and Research (Ind-Ra) believes India’s trade deficit will widen to a four-year high of 6.4 per cent of GDP in FY19 (178.1 billion dollar). According to an India Rating report, in FY18, merchandise trade deficit stood at 156.8 billion dollar (6.0 per cent of GDP) on account of a rise in oil and gold imports. Widening trade deficit, escalation in commodity prices, particularly oil, coupled with the expectation of the US Federal Reserve raising its rate further, is exerting pressure on the rupee. Even other emerging market currencies are facing headwinds. Rupee has depreciated below Rs 67/US Dollar mark in May 2018 from the high of Rs 63.35/US Dollar in January 2018. Lately, external trade has emerged as a critical component in India’s growth engine. At its peak in FY13, trade accounted 55.8 per cent of India’s GDP. However, post FY13, scenario changed due to sluggish global growth and rising protectionism. As a result, contribution of trade to India’s GDP declined with private consumption and government spending supporting the growth momentum. Based on FY18 estimates, trade contribution to economy decreased to 40.6 per cent. The Rating Agency said that on the import side, a 25.7 per cent surge in petroleum/petroleum product imports coupled with a 32.1 per cent rise in gold, silver and precious stones imports, led to the overall import registering a growth of 19.7 per cent to 459.7 billion dollar in FY18. The proportion of these two commodities in total import during FY14-FY18 was 41.4 per cent. Organic/inorganic chemicals and engineering goods exports registered a 10.0 per cent yoy growth to USD302.8 billion in FY18 led by the surge in petroleum products. Despite this double-digit growth, exports in FY18 were lower than FY15. It further said that India’s trade relations have increased significantly with Asian peers over the years driven by the Look East policy. Trade with China witnessed a CAGR (Compound annual growth rate) of 7.4 per cent over FY10-FY18, largely driven by imports. As a result, trade deficit with China widened to 57.9 billion dollar in 11MFY18 (FY10: 19.2 billion dollar). On the other hand, demand from Asian countries such as Bangladesh, Vietnam and Nepal contributed to the increase in exports. Ind-Ra has published the second edition of its monthly macroeconomics analysis (Arth Samvaad) which covers key domestic and global developments. Apart from the deep-dive on trade dynamics and heat map of the Indian economy, the report highlights macro-economic trends in the Indian economy using high frequency data on growth, inflation, trade balance, interbank liquidity, credit offtake, interest and exchange rates.